Director Marcucci moved, and Director Shepley seconded a motion to approve Ordinance SBD #14-08 requesting authority to purchase approximately 20.7 acres of real property (750-800 East Northwest Highway, Des Plaines, Illinois) for use as the new Pace Northwest Division garage. I sort of had that feeling, after that land was cleared a couple of years ago. ​This must have fallen through. There was an article in the Daily Herald today that someone is proposing 270 apartments at 800 East Northwest Highway, former site of Littelfuse. Further search found this Crain's article that some contractor purchased the Littelfuse property 750-800 East Northwest Highway in 2013. Maybe he sold it to someone else. Well, I put a comment in at the end of the article and through Facebook. We'll see if anyone responds. Daily Herald now has that Pace is looking at the Salvation Army property at Algonquin and Mt. Prospect Roads, but the Des Plaines police department is also looking at it. IMO, there must be sufficient vacant industrial property in Elk Grove Township. The police dept says they can't afford 8 million it would take to renovate the land to their specs. The residents and alderman sound like they don't want the bus garage there. They complain of pollution and noise to the houses west of there. But there shouldn't be much pollution if the garage were CNG, I would be more worried about an explosion. There is no noise at 2AM because Pace don't run at night over there. They are not CTA. If they put the entrance on Mt. Prospect and the facility is indoors that shouldn't have a noise effect on the neighbors even in the daytime. Really though they need to be close to Des Plaines because that's where most of the action is at NW. This location doesn't sound too bad, i just wonder if it's big enough. Do they have room for employee parking? The first thing you have to figure is that since Pace was not saying anything, only the NIMBYs get reported, although the Daily Herald isn't as bad in that regard as the Pioneer Press (now part of the Tribune). In that the site is already zoned manufacturing, it is sort of similar to the 19th Ward alderman yelling in another suburban Tribune publication (apparently The Southtown covers Beverly) that he can't do anything about a Dollar Tree moving in, but he'll harass it. Anyway, my point was that this seems to confirm that the proposed garage at 750-800 E. Northwest Highway is dead, so I guess trainman's cat doesn't need an answer to the Facebook comment. If one wanted to question anything, it would be why someone wants to put up a condo and townhouse development at that location. Finally, there is a bit of irony in needing adequate parking space next to a bus garage, but that's how it goes. If one wanted to question anything, it would be why someone wants to put up a condo and townhouse development at that location. Probably Cumberland Metra station; plus there's #208. Maybe railfan's get a discount. *Reference to Evanston unsuccessfully suing to keep out the North Shore garage. The Daily Herald finally cleared it up: "Pace officials considered the site, but negotiations to buy it fell through." Minutes for Oct. 2015 include "SBD #15-88 – Ordinance –Ordinance authorizing the execution of a purchase and Real Estate Sales Agreement (as amended) with The Salvation Army. Director Shepley moved, and Director Marcucci seconded the motion authorizing the execution of a purchase of Real Estate Sales Agreement (as amended). The motion passed..."
Does this finally resolve where the NW garage will be, as indicated above? What are they going to do with the residents over there? (If what CTA does is any indication, I guess that doesn't matter) If they did go all CNG though exhaust emissions would be miniscule. Hearing that the I-90 expansion is being staffed by 3 different garages, has got me wondering if perhaps this may be an extra Pace garage in addition to the current NW. The only other option would be use West or NS, but that sounds ridiculous. They have such a high concentration of proposed routes they almost sound like they could use the extra facility. To summarize the three articles, Pace made an offer on the property in October, hence the reference in the board minutes. In November, it was reported that Pace's interest in the site had decreased. A few days later however, the city of Des Plaines decided it would be too expensive to buy the property, perhaps renewing Pace's interest somewhat. Pace's hesitation to buy the site is due to required zoning changes that may not be approved due to local opposition. I'm going to wager that the 3 garages referenced are NW, River, and the new one. Obviously they'll need more garage capacity with the I-90 expansion coming. They may intend to build enough capacity at the Salvation Army site just to get the I-90 expansion going, and phase out NW completely at a later date. The Salvation Army property looks big enough for the buses currently at NW plus what is needed for I-90. So, 3 garages to start, but eventually only 2. That's the only plausible explanation I can come up with. To summarize the three articles, Pace made an offer on the property in October, hence the reference in the board minutes. In November, it was reported that Pace's interest in the site had decreased. A few days later however, the city of Des Plaines decided it would be too expensive to buy the property, perhaps renewing Pace's interest somewhat. Your point is that articles in Nov. postdate the Oct. meeting. However, the "city out" one was Nov.20 and the zoning one was Nov. 27. Basically, though, it gets down to if there was an agreement and if any agreement was subject to zoning approval. The potential deal with Salvation Army is contingent on Pace inspecting the property and also securing approval from city officials. In essence, though, you are correct that it is not resolved yet. *Compared to that either the RTA or Pace shoved the NS garage down Evanston's throat, but at least that land was originally zoned industrial; the complaint was the usual one for Evanston that it would take the property off the tax rolls. The last article I cited indicated that the alderman was opposed. If Wilmot meant what he said there, that kills it. Also it is pretty unlikely that just having restocked NW, and all the Pulse bus pictures, it is going CNG. The neighbors are not going to like a gas compressor there, either. I'm going to wager that the 3 garages referenced are NW, River, and the new one. Normal ambiguity in Pace grant requests. At least the dead proposal for the Tri-State Tollway TIGER grant said a new division for the Compobus fleet. Note that this proposal says to implement the whole rapid bus system. That would indicate something has to be done in the Joliet area. Also, if you go to the top of this thread, the legislation says the estimated cost of the NW garage is $60 million, and this application referred to $40 million each. Yeah I would have to agree that if they are going to the Salvation Army site that CNG at the current NW makes no sense. But if they built a new facility probably CNG will be part of the new construction because it's easier to install the infrastructure at a yet unopened facility. This seems to be the overall direction Pace is heading in an effort to further clean up Pace's emissions and save money on the fuel budget. I don't know what the holdup is at South but it would be nice to examine the overall effect of the upgrade on a pilot basis. Announcing a 2nd facility before the 1st is implemented shows great confidence in the technology but if it should turn out to not be viable it would be a waste of resources. Probably I would have the one pilot cng bus out there to gauge it's viability. I believe it was reported to be at the Pace acceptance facility. Unless the delay in south's implementation is the infrastructure not the buses. I believe it was reported to be at the Pace acceptance facility. Unless the delay in south's implementation is the infrastructure not the buses. Someone would have to take a trip to South Holland (if the acceptance facility is still there) and check it out. Obviously, Pace already has 15500 and the only question is if deliveries have started in the production run. I'm referring to #15500, which while it is the prototype most likely it is the pilot bus. It doesn't have clear differences like the demonstrator, which I believe was numbered #2010 with it's flush mounted tinted windows. The difference is that the Pace minutes at the time clearly authorized paying for the one CNG bus. As I posted before, the specs state that 20 buses have to be delivered for the start of service, just now the start of service is not June, 2014. I'm just noting that it's kind of weird not to see #15500 in service anywhere even on one light run? It's better to see the flaws now versus after 20 buses are here, maybe Eldorado can make adjustments. If i was gambling here, I'd say south does not yet have a fully functioning CNG facility, but it never stopped CTA from getting special fuel for it's #5900's. I say maybe lease the use of a CNG fueling station just for the one bus so they can at least experiment. I hear in places in Colorado you can just drive your car up to a natural gas station for those that have cars running on natural gas. The infrastucture could be the problem; notes on the home page indicate that construction is ongoing. However, it is much more complicated than just "leasing a fueling station." Until one with a compressor is built, maybe the only alternative is if some trucking company or garbage hauler in Markham or vicinity has one. Also, they can't store it inside fueled until the garage modifications (like changing gas furnaces with open flames) are complete. South Bend Transpo took the risk, if that's any precedent. They got their CNG's about a year before the fueling station opened, but they also had a monetary incentive to have the buses delivered early. But then, how did they fuel them? This article indicates that they sat until the station was built. That's correct, they were parked until the fueling station opened. I was responding to BusHunter's comment about putting them all in service at once, as opposed running one "test bus" so that potential flaws could be detected before the rest are built. Come to think of it, when I was in South Bend on Oct 27, I only saw one CNG bus running. Don't know if that means anything. 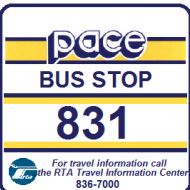 Over the course of the year, Pace will begin deploying compressed natural gas (CNG)-powered buses in the south suburbs, after the agency completes construction work for a CNG fueling station at Pace’s South Division garage in Markham. I still don't get why they just couldn't pull up to a CNG station. They must have some gas in them or they wouldn't operate at all and essentially be parked indefinitely at the acceptance facility. You know there are truck fleets that have CNG fleets like Waste Management and if those trucks went to Bus and Truck for repair.... Is it a leap to think bus and truck has a CNG fueling facility? If so, maybe they could get some gas there, just to experiment. It seems now they have the 20 buses at acceptance and we're twiddling our thumbs. I wonder how long do they have before they have to commit to the 21st bus?